Sometimes your bird needs some company when your not home. 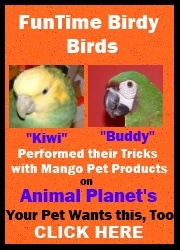 The Bird Sitter DVD is a perfect companion for your feathered friend. Want to teach your birdie how to behave and learn some new tricks?.....Barbara Heidenreich has a great series of DVD's from behavior modification all the way through preparing your feathered baby for a vet visit.